Hawk Watchers with their eyes on the skies! September and October brings the migration of thousands of hawks and other species through the Monadnock Region. 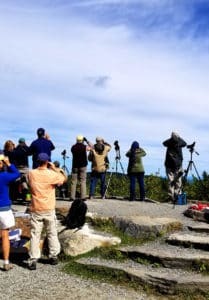 The Pack Monadnock Raptor Migration Observatory stationed at Miller State Park in Peterborough NH, is one of the prime spots to view and learn. 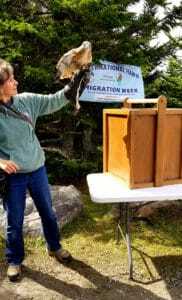 To kick off this year’s migratory season, the Hawk Migration Association of North America (HMANA for short) hosted International Hawk Migration Week events. The Harris Center and the NH Audubon were on site as well as many hawk watchers with their trusty binoculars. We headed up Pack Monadnock on Saturday and it turned into a perfect day to watch for hawks. This red-tailed hawk was just as curious about us as we were him! 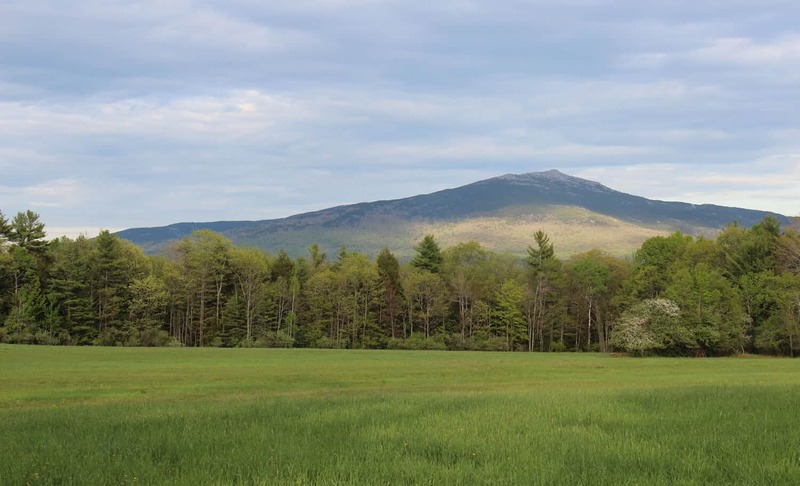 You can reach the Raptor Observatory atop Pack Monadnock by foot or by car. We chose to drive and found several others with their binoculars and periscopes, avidly watching as raptors of all kinds flew overhead on their journey south. Harris Center representatives tallied the raptor counts and answered questions. They had a table full of informational pamphlets and shirts for sale to benefit the Harris Center as well, and even extra binoculars to spare for those who were interested. 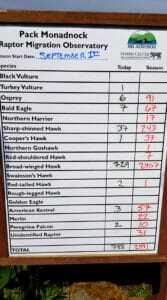 When we arrived, we checked the white tally board with the count of each species spotted that day and the total seen for the season. We were amazed that they had seen over 750 that day and that in the afternoon the count went over 1,000! We were lucky to get there in time for the NH Audubon to bring one of their permanent rescues to answer questions. A beautiful red-tailed hawk visited, giving us an up close view of a cousin of what we’d been watching in the sky all morning. Later in the afternoon three more rehabilitated hawks were released to join up with the others as they southern migration. Keeping track of all the different species. During weekends, NH Audubon’s biologist is on site to answer questions. Weekdays, you may find yourself with company as other dedicated hawk watchers and volunteers have set up to view and count the different kinds of raptors on their journey. The annual raptor migration is a unique and fascinating highlight of the Monadnock Region. We highly recommend that you head up to the Pack Monadnock Raptor Observatory to take a view yourself. No matter how many raptors you spot, you will be treated to gorgeous view! This entry was posted in Autumn, New England, Outdoor Activities, Peterborough, State Parks and tagged hawk migration, hawk watch, New England, New Hampshire, Peterborough NH by Meaghan Woods. Bookmark the permalink.